I think that it is high time that we remembered that the Constitution, as amended, speaks not only of the freedom of speech but also of trial by jury instead of trial by accusation. 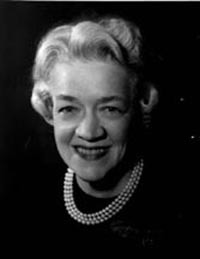 Margaret Chase Smith (14 December 1897 - 29 May 1995) was an U.S. politician, a Republican Senator from Maine, the first woman to be elected to both the US House and the Senate, and the first woman to have her name placed in nomination for the US Presidency at a major party convention (1964 Republican). Freedom unexercised may be freedom forfeited. The preservation of freedom is in the hands of the people themselves — not of the government. One of the basic causes for all the trouble in the world today is that people talk too much and think too little. They act too impulsively without thinking. I am not advocating in the slightest that we become mutes with our voices stilled because of fear of criticism of what we might say. That is moral cowardice. And moral cowardice that keeps us from speaking our minds is as dangerous to this country as irresponsible talk. The right way is not always the popular and easy way. Standing for right when it is unpopular is a true test of moral character. The importance of individual thinking to the preservation of our democracy and our freedom cannot be overemphasized. The broader sense of the concept of your role in the defense of democracy is that of the citizen doing his most for the preservation of democracy and peace by independent thinking, making that thinking articulate by translating it into action at the ballot boxes, in the forums, and in everyday life, and being constructive and positive in that thinking and articulation. 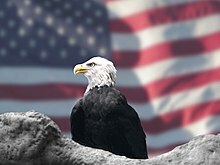 The most precious thing that democracy gives to us is freedom. You and I cannot escape the fact that the ultimate responsibility for freedom is personal. Our freedoms today are not so much in danger because people are consciously trying to take them away from us as they are in danger because we forget to use them. Freedom unexercised may be freedom forfeited. The preservation of freedom is in the hands of the people themselves — not of the government. I am running against no one. I'd like to be President. I think my experience and my record are greater than any other candidate or any other of the unannounced candidates. It's a real challenge, and that's one of the paramount things. When people keep telling you that you can't do a thing, you kind of like to try it. Declaration of Conscience‎ (1972), p. 293; also misquoted as ending with "the end justifying any means and any measures." I don't believe the American people will uphold any political party that puts political exploitation above national interest. 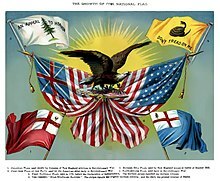 As an American, I want to see our nation recapture the strength and unity it once had when we fought the enemy instead of ourselves. It is ironical that we Senators can in debate in the Senate directly or indirectly, by any form of words, impute to any American who is not a Senator any conduct or motive unworthy or unbecoming an American — and without that non-Senator American having any legal redress against us — yet if we say the same thing in the Senate about our colleagues we can be stopped on the grounds of being out of order. I think that it is high time for the United States Senate and its members to do some soul-searching — for us to weigh our consciences — on the manner in which we are performing our duty to the people of America — on the manner in which we are using or abusing our individual powers and privileges. The American people are sick and tired of seeing innocent people smeared and guilty people whitewashed. Today our country is being psychologically divided by the confusion and the suspicions that are bred in the United States Senate to spread like cancerous tentacles of "know nothing, suspect everything" attitudes. Today we have a Democratic Administration that has developed a mania for loose spending and loose programs. History is repeating itself — and the Republican Party again has the opportunity to emerge as the champion of unity and prudence. Yet to displace it with a Republican regime embracing a philosophy that lacks political integrity or intellectual honesty would prove equally disastrous to this nation. The nation sorely needs a Republican victory. But I don't want to see the Republican Party ride to political victory on the Four Horsemen of Calumny — Fear, Ignorance, Bigotry, and Smear. I don't believe the American people will uphold any political party that puts political exploitation above national interest. Surely we Republicans aren't that desperate for victory. I don't want to see the Republican party win that way. While it might be a fleeting victory for the Republican Party, it would be a more lasting defeat for the American people. As a United States Senator, I am not proud of the way in which the Senate has been made a publicity platform for irresponsible sensationalism. I am not proud of the reckless abandon in which unproved charges have been hurled from this side of the aisle. I am not proud of the obviously staged, undignified countercharges that have been attempted in retaliation from the other side of the aisle. I don't like the way the Senate has been made a rendezvous for vilification, for selfish political gain at the sacrifice of individual reputations and national unity. 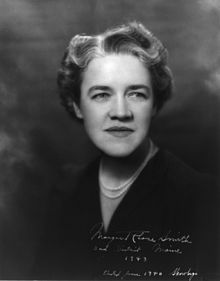 Senator Margaret Chase Smith, the so-called Quiet Woman from Maine, is neither tongue-tied nor coy; instead she likes to pick her shots, believing that "a statement does not have real meaning and validity unless I am moved to make it, rather than prodded by someone else." This must be one of those moments, for here Mrs. Smith is positively gabby, chirping away about the high points of her political career like any other lawmaker up for reelection this November. Mrs. Smith said her life in politics was her only life. "I have no family, no time-consuming hobbies," she said late in her Senate career. "I have only myself and my job as United States Senator." But she also had a sense of humor. In 1952, when asked by a reporter what she would do if she woke up one morning and found herself in the White House, she replied: "I'd go straight to Mrs. Truman and apologize. Then I'd go home." Last week Maggie Smith, 66, confessed before the National Women's Press Club in Washington that she has no money, no time to campaign and no organization to speak of. There upon she announced saucily that she is going to run for the G.O.P. presidential nomination just the same. Stickler. Many people shrug off the lady Senator's declaration as something frivolously feminine. They don't know Maggie. Feminine she is, but not frivolous.